Whether you’re dealing with a travel agency or taking a solo ride, planning and packing for your exotic trip can seem like a never-ending task. At Vintage Rides, we believe there’s no guidelines to be followed – but a little support from some experienced travelers can come as a great help. After 10 years of motorbike trips in India, Nepal or Thailand, here are a few of the tips we’ve come up with! Clothes are likely to take the more space in your packing – so start by focusing on this stage and it will make things easier for the rest. » Favor wool clothes: by nature, wool is difficult to get wet to the touch. Your clothes – and your body – will be warm and dry for long! Also, it’s one of the only fabrics which doesn’t absorb any odor. It can come on handy if you’re planning to wear your attire for more than one day. » If you’re going to a remote location without any washing facilities, try to avoid cotton clothes. They are much longer to dry naturally after a hand wash.
» Did you know that the Japanese roll their clothes rather than folding them? Try it. It takes much less space. Once you’re done with the clothes, it can be nice to decide which contents you’re going to bring. This step has to be anticipated as it may require some shopping. » Make sure to have a small backpack of 20 liters – it will be easy to slip in your daily necessities such as camera, sunscreen lotion, etc. » Depending on the destination you’re heading to, you may face one of Asia’s renowned monsoon. Zipper-lock plastic bags can be very useful to carry your stuff inside your bigger bag and make sure it stays dry. » If you’re cold sensitive, take a warm sleeping bag which can be used as an extra duvet. » If you’re travelling with friends, pack together to mutualize space and weight. » Don’t forget to tag your bags! After being done with other essentials we don't need to mention (bike gear, medical kit, etc.) here are some fun last items to pack. 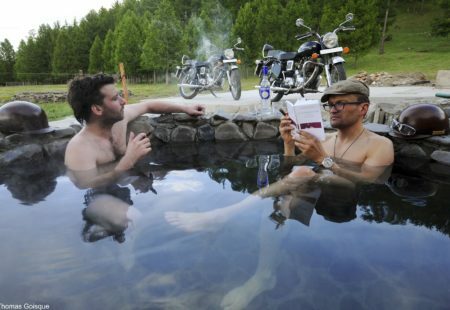 We bet you didn’t think about it, but they can make a difference in your Mongolia, Bhutan or Sri Lanka motorcycle trip! » Take a Polaroid - or any type of camera which can provide a picture on spot. You’ll likely stay in remote locations where the locals are not used to having pictures of themselves. Why not offer them this unexpected souvenir? Fujifilm produces mini polaroid cameras (Instax model) from $ 70 US. » Pack some sweets, cereal bars, or any of your favorite treat. You’ll be eating a lot of the local food and sometimes a little taste of your own can enlighten a meal! » Beyond taking a specific object, make sure to leave your cultural habits and clichés at home! 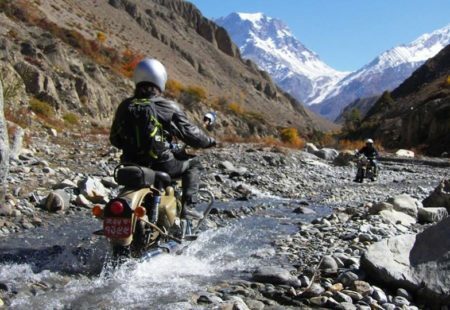 This is how you'll enjoy your motorbike tour in Asia at its best. 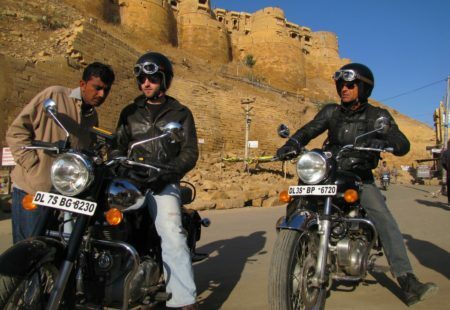 Vintage Rides>The blog>Custom Workshop & Bike Tips>What to pack for an Asia motorcycle trip?